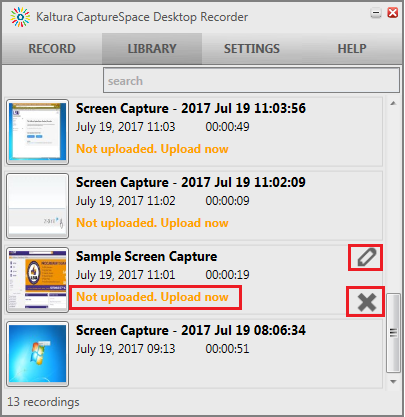 Kaltura's CaptureSpace Lite Desktop Recorder allows instructors and students to easily create videos. 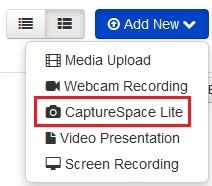 For more information on the recording options, see CaptureSpace Lite Overview. The Library contains a list of the video and audio recordings. When creating a a video, the user has the option to upload it immediately, or save it locally. Both instances will keep the video in the Library. 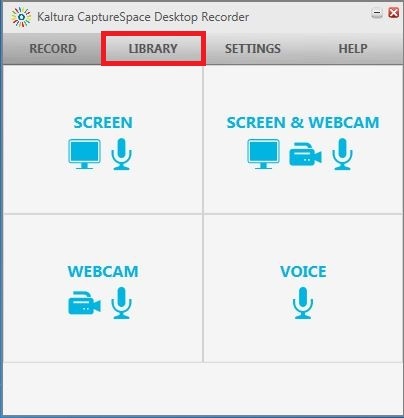 From here, users can manage their recordings created in the desktop recording program. 5. Click the Library tab to access the video and audio recordings created in the Desktop Recorder. 6. Locate the video or audio file you need. Each file has options. Clicking the Edit button (looks like a pencil) will take you to the Preview screen where you can do basic editing like trimming and chopping. The Delete (X) button will permanently remove the video or audio file permanently remove it from the Library (and computer). If the file contains the Not uploaded. Upload now link, click on it to upload the file to your My Media area in Moodle. 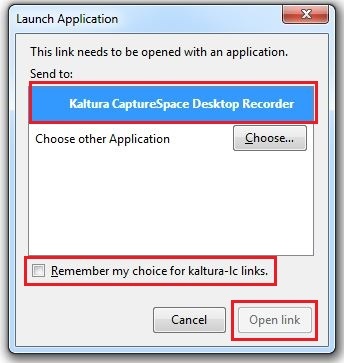 Once uploaded, see Grok article Adding a Kaltura Video Resource to add it to your course.